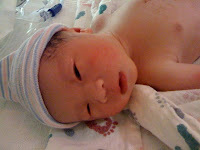 woohoo...my 2nd nephew has arrived! he was 3 weeks early and was actually a decent size for being this early. he was born 5 days after aj's birthday! we will now have joint birthday parties! heehee. while visiting my sister in the hospital, we realized that her nurse was my nurse from a year ago! she was happy to see aj as she rarely ever sees the babies again once they leave the hospital. this poor 3rd boy - so neglected. half the time, we forget that there is a newborn in the house! the other day, i went into his nursery to get a diaper for aj and i turned on the lights without even realizing he was sleeping in his crib. oops. my little peanut turns 1! i know, peanut isn't quite appropriate considering he's quite a chunky monkey now! i'm a little late in posting his 1st birthday but it's been insanely busy at work and i've barely had a moment to come up for air. still very consistent in his growth. poor guy had 3 shots since we decided to give him the regular flu, H1N1 and hep a shot. he'll have to go back in a couple of months to get his other immunization shots that he didn't get since we gave him both flu shots. where do i even begin about his recent developments? personality biggest observation...boy, is he stubborn and fearless. he also throws some major attitude and tantrums. both my sister and my mother have noticed how he has no fear in putting his hands everywhere and climbs up on everything. he is definitely standing up to his nephew now and throws quite a tantrum when my nephew is in his "space". when he doesn't get what he wants, man, is he fierce. my mom says this is what i get for being such a stubborn child myself. other than his stubborn nature, he's still more like his dad. still very laidback and plays well by himself. he does occasionally get clingy, but for the most part adjusts easily w/ different people and surroundings. nutrition we are very lucky that he eats everything. and lots of it too! he still loves his milk but loves fruits and cheerios and really, any snack we give him. the only issue is he hates wearing his bib. he tries to pull it off every time we put it on. mobility close to his birthday, he had teased us with taking a couple of steps every now and then. however, last week, he took ten steps and now he is a walking machine. we went to the stanford mall and that was his first time walking around in public. it was great to let him walk in such an open space and not feel like you are in someone's way. he still crawls when we wants to go somewhere fast but he definitely tries to walk everywhere first. sleep so we regressed a couple of weeks ago. he started waking up in the middle of the night and we just took him to our bed. so, now every night, he falls asleep in his crib but will wake up in the middle of the night. we'll go pick him up and he'll sleep between us until it's time to get up! we need to sleep train him again but we actually really enjoy his smiling face when we wake up.